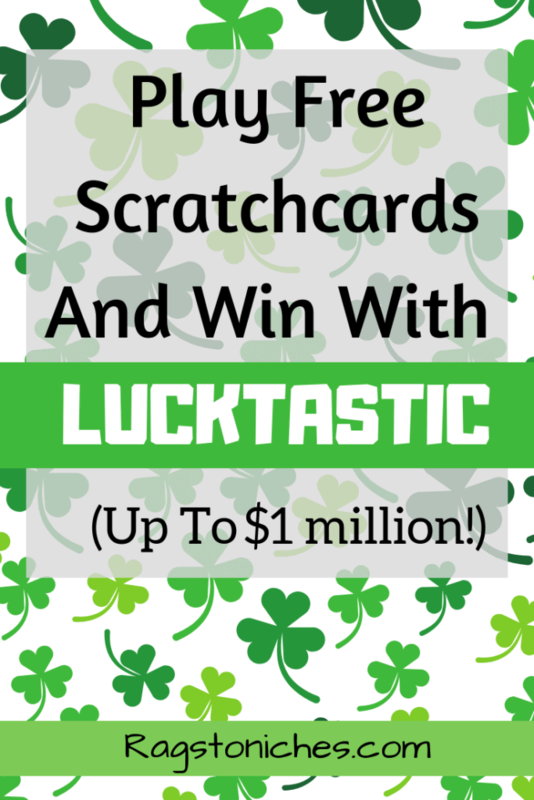 Lucktastic App Review: Do You Feel Lucky? Last updated on January 16, 2019 By Nat Leave a Comment This post may contain affiliate links. We appreciate you supporting Rags To Niches! Full disclosure here. Lucktastic is a free app you can download, giving you the opportunity to win prizes and redeem rewards. Unfortunately, this app is currently only open to US residents. If you’re outside the US, you could try Lucky Day instead, (although there have been some complaints about them – check out this review and see what you think). You can currently download Lucktastic via Google Play, or the App store, it’s not available on the PC at this time. Any US citizen over the age of 13, can sign up! Money Making Opportunity: A small change to win cash and redeem prizes – for free. Verdict: Lucktastic is legit, but is it worth it? Read on and see what you think. Naturally, your chance of winning is slim, but this is a free app that is of no monetary cost to you. Fed Up Of Relying On Luck?…. Stick With Me To The End Of This Post For Other Ideas. How Do You Win With Lucktastic? For the most part, this is going to be like a virtual version of your regular scratchcard. Well, a free scratchcard that is. Of course, the odds are not going to be stacked in your favor, but it is free. Some people find that doing FREE virtual scratchards, actually helps them stop buying the real thing… which can’t be a bad thing! The annoying aspect, (as with many Apps) is that you will have to put up with looking at Ads in-between scratch-offs. However, this is going to be how this App makes money, so it’s necessary if you want to enjoy the App for free. I’ve outlined the key ways you can win money with this App below…. There are many different scratchcards available and will only take seconds of your time. Each scratchcard will have six boxes – your aim will be to scratch them off and find 3 matching symbols. If you do find 3 matching symbols, you will win the prize stated. If you don’t win, you will still win reward tokens – this token will be found in the bonus scratch section of each card. Prizes per card are going to be between $2-$1500 for the most part. Some scratchcards are for bonus tokens and you will always win bonus tokens in each regular scratchcard you do as well. You can save up bonus tokens, in order to exchange them for rewards, (such as gift cards). With some scratchcards, you can also win contest entries. Win $500 worth of Amazon vouchers – 50 winners each day. Win groceries for a month, ($500! monthly winner). Win gas for a month. Lucktastic reward you for coming back on consecutive days – come for four days in a row to receive a bonus daily reward. If you go further and reach to five days in a row, you will get a mystery bonus rewards! The bonus could be – bonus tokens, contest entries, or even cash. The more consecutive days you come and play on the app, the more chances you get to redeem rewards. They have a $5k scratchcard incentive running, which may encourage you to log in more often. To be eligible, you must login and do at least one scratchcard for four consecutive days. After which time, you will be able to have a go at the $5,000 scratchcard. To play the $10,000 scratchcard…. You first need to unlock it! In order to do so, you must scratch off a minimum of 150 scratchcards, (it doesn’t matter what type). As soon as you have done this the $10,000 scratchcard will be unlocked and it will remain so. The scratchcards only take seconds to do, it won’t take you long to unlock. If you download the apps via the Lucktastic app, you can receive more bonus tokens. You may often have to follow certain instructions, in order to be eligible for your tokens, so follow them carefully. This will involve interacting with the app you download, in some way. You can recommend your friends and family join Lucktastic for 1000 extra tokens. You can use these tokens to enter contests, or to redeem rewards. You’re able to invite friends via social media, email, or SMS. Related: Survey Sites That Pay To Refer. You have the potential to win a Million dollars at the time of writing. This is a chance for one lucky winner. Whoever is selected, will have the chance to play their pots of gold minigame and potentially go home with a million dollars. To be in with a chance of winning, use your bonus tokens to enter as many times as you like. There is also a free daily entry on the Lucktastic dashboard. Free to play scratchcards and enter contests daily. Potential to win 1 million dollars. Some high prizes of 5k and 10k, that you can unlock. Save bonus tokens to redeem rewards, like gift cards. Potentially save money, by avoiding playing real lotto, or buying scratchcards. Potential to waste too much time on the app, as there isn’t much chance of actually winning. You will have to view adds before playing the scratchcard games -which can become tedious. You may have a slim chance of wining, but the same can be said for the lottery and at least this is free. Also, I like the fact that this could potentially prevent people from spending money on the real thing. Another great incentive, is that they have this million dollar prize – plus higher scratchcard prizes, such as the 5k and the 10k. Lucktastic has for stars on google play and an over 300,000 reviews!!!! That’s really some accomplishment – to maintain that high level of feedback, from so many people. Some people do find the Ads excessive, but that’s how they fund this App and why it’s for free. But you have to presume that you will probably not win anything! If you don’t enjoy just playing on the app, then it’s probably not going to be worth it for you. Ultimately, It’s free and a bit of fun. Lucktastic is a legit app and they will pay you if you win. Apps are one of the newest ways that we can make money online, or on the move. As yet, everything I have seen only presents a way to make a small amount, (oh, apart from healthywage… but you do need to lose weight for that!). However, I feel that as technology develops further, we will find better opportunities arising with apps & I will certainly be sharing those opportunities as they arise! 5 Apps where you can win real money. 14 smartphone Apps that will make you money. 6 Apps that can pay you to walk. An App that will pay you up to $10,000 to reach your weight loss goals. Beyond Lucky Apps? Making Your Own Luck! I used to enter thousands of online contests every month and won some amazing prizes. But long term, I didn’t want to be doing something that relied so much on my time… without any guarantees of winning. That’s why I came online, looking for other opportunities. I make money from writing about things I’m interested in and get paid via paid advertising on my website and affiliate marketing. That means, that an article I write today, about anything I choose, could continue to pay me years into the future. This is an example of how you can avoid exchanging your time for money. If you’d like to learn how you can do the same, you can start for free here. For some other ideas, check out my 40+ ways to earn money online. That wraps up my Lucktastic review for today… If you have any experience with the app that you’d like to share, let me know in the comments!